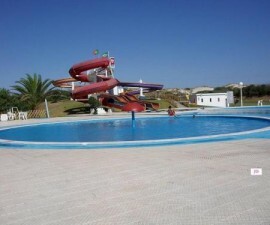 Mariparque Aqua Park is situated at Vieira de Leiria in the Marinha Grande Province. Serviced by both the A8 Atlantic Highway and the A17 it is easily accessible from a number of locations. Plenty of visitor parking is available along the beachside strip that adjoins the park. The park is open from June to September and entrance fees range between €5.50 and €11.00. Children under 4 go free and there are concessions for children under 10 and the over 65s. At Mariparque the emphasis is firmly on fun. 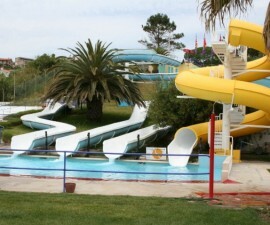 The main water installations include a triple slide descent offering three drops of differing heights and speeds. A fourth enclosed tube run is also attached to these, offering plenty of variety. To the other side of the park is a four-way wave drop where guests can race each other to the bottom. Several spirals and chutes complete the main slide attractions. Children are well taken care of at Mariparque. There are several slow tracks that are well suited to younger guests as well as a dedicated Aqualandia park where they can bathe securely and play in shallow waters to their heart´s content. When (or if!) they are ready to take a break from the water they can make their way to the game park for some dry-land entertainment with new-found friends of their own age. 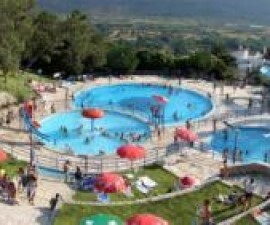 The large swimming pools make a fitting centrepiece to the park complex. Here you can take a leisure dip to refresh your senses, swim a few lengths to counteract your holiday indulgences or join in one of the aqua exercise sessions that take place regularly, led by trained aqua fitness instructors. While most guests visit the park with the water installations in mind, there is much more to enjoy besides. 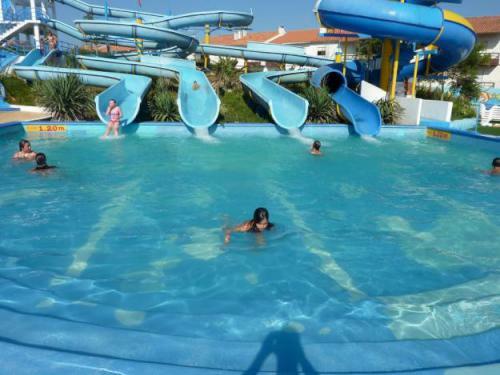 The park is linked to the Hotel Cristal Vieira Beach offering guests a diverse range of activities. If you feel in need of spending some time on dry land, play a round or two on the mini golf course, hire a tennis court for an hour or head to the multisport arenas and get involved in one of the football, volleyball or netball sessions. If you can´t get enough of Mariparque check into the adjacent hotel for sea views, fine dining, panoramic bars, health club and spa. All in all the perfect finish to a perfect day.